Waking up with a stuffy nose isn’t fun for anyone, and if you could invest a small amount of money and effort to prevent it, you’re likely to do so. A humidifier can help alleviate a host of problems, and one of the best is a cool mist ultrasonic humidifier. You have a lot of choice when it comes to type of humidifier you choose, brand, and size. This guide will help you figure out all the answers to those questions. You’ll also learn what the drawbacks are, so you can decide whether the issues are minor. 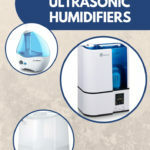 Read through the best ultrasonic humidifier reviews to find out what the biggest problems were with each top-rated humidifier. Then you’ll be ready to pick the ultrasonic humidifier that’s right for you and your family.